AcuPressure Doctor is your ONE STOP GUIDE App for ROUTINE health, SEXUAL health, WOMEN health, MEN health, CHILDREN health & LOT MORE! (We were Ranked#1 App/Featured App/NewsWorthy App of the week in June in Medical Category of iPad!) AcuPressure Doctor will guide you with AcuPressure Points one should press to gain potential benefits and relieve oneself from any of the health problems. Download AcuPressure Doctor TODAY to find out what Pressure Points you should start practicing TODAY! 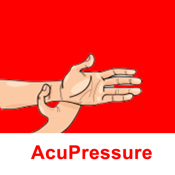 AcuPressure Doctor is a must have AcuPressure App that details out all the various Pressure Points with beautiful graphics and step by step guide on how to press them.